With the release of PowerShell 2.0, we now have a PowerShell module that we can use to administer Active Directory. The Active Directory Module for Windows PowerShell runs on Windows Server 2008 R2 and on Windows 7 and relies on a web service that is hosted on one or more domain controllers in your environment. 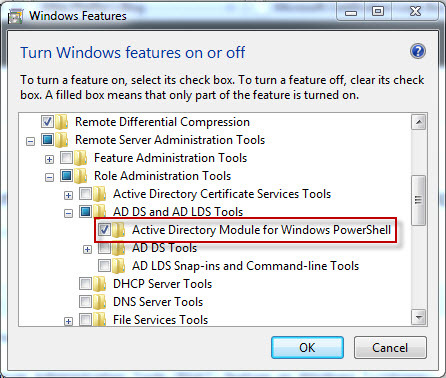 In this post I’ll go over what you need in order to install and use the Active Directory Module for PowerShell, also known as AD PowerShell. At this point, you should be ready to install the AD PowerShell module. You can run AD PowerShell on all versions of Windows Server 2008 R2 (except the Web Edition) and on Windows 7. Remember, this only needs to be done on Windows Server 2008 R2 member servers. The RSAT-AD-PowerShell feature will be added to 2008 R2 DC’s during the DCPromo process. That’s all that needs to be done to get up and running. Below is a list of the new AD cmdlets that will be available and a synopsis of what they do. Add-ADComputerServiceAccount Cmdlet Adds one or more service accounts to an Active Directory computer. Add-ADDomainControllerPasswordReplicationPolicy Cmdlet Adds users, computers, and groups to the allowed or denied list of a read-only domain controller password replication policy. Add-ADFineGrainedPasswordPolicySubject Cmdlet Applies a fine-grained password policy to one more users and groups. Add-ADGroupMember Cmdlet Adds one or more members to an Active Directory group. Add-ADPrincipalGroupMembership Cmdlet Adds a member to one or more Active Directory groups. Clear-ADAccountExpiration Cmdlet Clears the expiration date for an Active Directory account. Disable-ADAccount Cmdlet Disables an Active Directory account. Disable-ADOptionalFeature Cmdlet Disables an Active Directory optional feature. Enable-ADAccount Cmdlet Enables an Active Directory account. Enable-ADOptionalFeature Cmdlet Enables an Active Directory optional feature. Get-ADAccountAuthorizationGroup Cmdlet Gets the accounts token group information. Get-ADAccountResultantPasswordReplicationPolicy Cmdlet Gets the resultant password replication policy for an Active Directory account. Get-ADComputer Cmdlet Gets one or more Active Directory computers. Get-ADComputerServiceAccount Cmdlet Gets the service accounts hosted by a computer. Get-ADDefaultDomainPasswordPolicy Cmdlet Gets the default password policy for an Active Directory domain. Get-ADDomain Cmdlet Gets an Active Directory domain. Get-ADDomainController Cmdlet Gets one or more Active Directory domain controllers based on discoverable services criteria, search parameters or by providing a domain controller identifier, such as the NetBIOS name. Get-ADDomainControllerPasswordReplicationPolicy Cmdlet Gets the members of the allowed list or denied list of a read-only domain controller’s password replication policy. Get-ADDomainControllerPasswordReplicationPolicyUsage Cmdlet Gets the Active Directory accounts that are authenticated by a read-only domain controller or that are in the revealed list of the domain controller. Get-ADFineGrainedPasswordPolicy Cmdlet Gets one or more Active Directory fine grained password policies. Get-ADFineGrainedPasswordPolicySubject Cmdlet Gets the users and groups to which a fine grained password policy is applied. Get-ADForest Cmdlet Gets an Active Directory forest. Get-ADGroup Cmdlet Gets one or more Active Directory groups. Get-ADGroupMember Cmdlet Gets the members of an Active Directory group. Get-ADObject Cmdlet Gets one or more Active Directory objects. Get-ADOptionalFeature Cmdlet Gets one or more Active Directory optional features. Get-ADOrganizationalUnit Cmdlet Gets one or more Active Directory organizational units. Get-ADPrincipalGroupMembership Cmdlet Gets the Active Directory groups that have a specified user, computer, group, or service account. Get-ADRootDSE Cmdlet Gets the root of a Directory Server information tree. Get-ADServiceAccount Cmdlet Gets one or more Active Directory service accounts. Get-ADUser Cmdlet Gets one or more Active Directory users. Get-ADUserResultantPasswordPolicy Cmdlet Gets the resultant password policy for a user. Install-ADServiceAccount Cmdlet Installs an Active Directory service account on a computer. Move-ADDirectoryServer Cmdlet Moves a directory server in Active Directory to a new site. Move-ADDirectoryServerOperationMasterRole Cmdlet Moves operation master roles to an Active Directory directory server. Move-ADObject Cmdlet Moves an Active Directory object or a container of objects to a different container or domain. New-ADComputer Cmdlet Creates a new Active Directory computer. New-ADFineGrainedPasswordPolicy Cmdlet Creates a new Active Directory fine grained password policy. New-ADGroup Cmdlet Creates an Active Directory group. New-ADObject Cmdlet Creates an Active Directory object. New-ADOrganizationalUnit Cmdlet Creates a new Active Directory organizational unit. New-ADServiceAccount Cmdlet Creates a new Active Directory service account. New-ADUser Cmdlet Creates a new Active Directory user. Remove-ADComputer Cmdlet Removes an Active Directory computer. Remove-ADComputerServiceAccount Cmdlet Removes one or more service accounts from a computer. Remove-ADDomainControllerPasswordReplicationPolicy Cmdlet Removes users, computers and groups from the allowed or denied list of a read-only domain controller password replication policy. Remove-ADFineGrainedPasswordPolicy Cmdlet Removes an Active Directory fine grained password policy. Remove-ADFineGrainedPasswordPolicySubject Cmdlet Removes one or more users from a fine grained password policy. Remove-ADGroup Cmdlet Removes an Active Directory group. Remove-ADGroupMember Cmdlet Removes one or more members from an Active Directory group. Remove-ADObject Cmdlet Removes an Active Directory object. Remove-ADOrganizationalUnit Cmdlet Removes an Active Directory organizational unit. Remove-ADPrincipalGroupMembership Cmdlet Removes a member from one or more Active Directory groups. Remove-ADServiceAccount Cmdlet Remove an Active Directory service account. Remove-ADUser Cmdlet Removes an Active Directory user. Rename-ADObject Cmdlet Changes the name of an Active Directory object. Reset-ADServiceAccountPassword Cmdlet Resets the service account password for a computer. Restore-ADObject Cmdlet Restores an Active Directory object. Search-ADAccount Cmdlet Gets Active Directory user, computer, or service accounts. Set-ADAccountControl Cmdlet Modifies user account control (UAC) values for an Active Directory account. Set-ADAccountExpiration Cmdlet Sets the expiration date for an Active Directory account. Set-ADAccountPassword Cmdlet Modifies the password of an Active Directory account. Set-ADComputer Cmdlet Modifies an Active Directory computer object. Set-ADDefaultDomainPasswordPolicy Cmdlet Modifies the default password policy for an Active Directory domain. Set-ADDomain Cmdlet Modifies an Active Directory domain. Set-ADDomainMode Cmdlet Sets the domain mode for an Active Directory domain. Set-ADFineGrainedPasswordPolicy Cmdlet Modifies an Active Directory fine grained password policy. Set-ADForest Cmdlet Modifies an Active Directory forest. Set-ADForestMode Cmdlet Sets the forest mode for an Active Directory forest. Set-ADGroup Cmdlet Modifies an Active Directory group. Set-ADObject Cmdlet Modifies an Active Directory object. Set-ADOrganizationalUnit Cmdlet Modifies an Active Directory organizational unit. Set-ADServiceAccount Cmdlet Modifies an Active Directory service account. Set-ADUser Cmdlet Modifies an Active Directory user. Uninstall-ADServiceAccount Cmdlet Uninstalls an Active Directory service account from a computer. This script will start or stop a service on a remote computer. It will optionally allow you to retrieve the current state of the service before and after you make a change. This is useful for verifying the state of the service before you make a change and to verify the change has been applied. svc = "Win32_Service=" & "'" & svcName & "'"
A useful script, especially for those high maintenance users who insist on editing excel or word documents they open from Outlook and then frantically calling your help desk complaining they can’t locate files they saved while working in Outlook. Place the script on their desktop and have them run it first before calling your help desk.. Works with Outlook 2003, 2007, 2010 and now also with Outlook 2013.